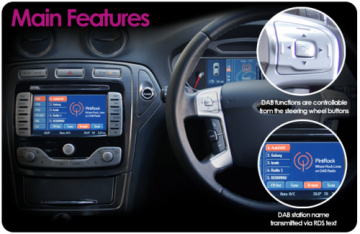 This is a product that will add Digital Radio (DAB) to your vehicle without having any extra boxes on show. 'AutoDAB' integrated Digital Radio Adaptor. When fitted it is completely hidden behind the dash in the car for a 'factory look'. It is controlled using the vehicle's factory steering wheel controls, and displays Digital Radio information on the Factory Stereo display. The AutoDAB has a voice prompt menu system, for added safety. The Autodab can be fully installed by our IMI certified and experienced installers. AutoDAB have developed a full range of DAB interfaces which cover 90% of all vehicles on the road in Europe. DAB stations can be selected from the vehicles steering wheel controls, allowing seamless DAB integration into your vehicle. The AutoDAB can only be controlled using the steering controls and not the factory stereo buttons!. We offer an installation service for customers in the SUTTON COURTNEAY, OXFORD, OXFORDSHIRE, DIDCOT, WITNEY, SOUTHMOOR, WANTAGE, WALLINGFORD, ABINGDON, COWLEY, HEADINGTON, BIECESTER, BANBURY and OXFORDSHIRE areas.